Recover EX is an 'industry first' post workout recovery supplement using research proven, scientifically dosed ingredients which have been shown to support recovery from exercise induced muscle and system wide damage. 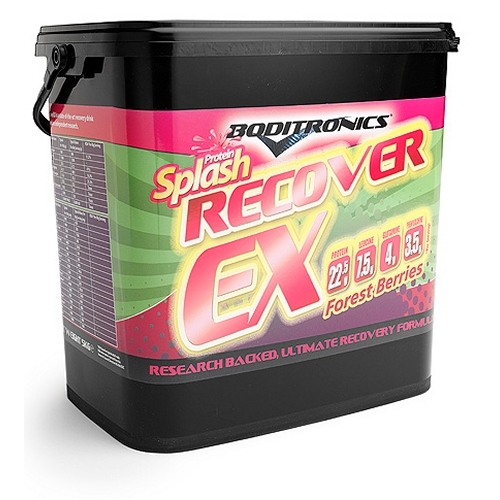 Boditonics Recover-EX provides a perfect amino acid profile both for biological value and post exercise functioinality by including only fast release whey protein isolate combined with additional Glutamine Peptides to rapidly flood the body with protein. To counter the catabolic effects of training, Recover EX contains simple carbohydrates to replenish muscle glycogen and liver glycogen in order to reverse the bodys catabolic state. It fortifies this with a small amount of complex carbohydrates to maintain insulin levels and create a long term anabolic status. Boditronics have created a post workout supplement aimed at those who don't want heavy milk shake flavour drinks. Part of the splash family, recovery EX is available in Orange and passion fruit, zesty lemonade or forest berries flavour for a refreshing post workout experience. Featuring whey protein isolate, glutamine peptides, high amounts of leucine & phenylanine your body is provided with an ideal blend of much needed amino acids essential for recovery. Thanks to a high ratio of aminos, recovery is optimised as the window of opportunity after training is a mere 30 minutes or so. As amino acids do not need breaking down in the stomach by endo and exopeptidase they can enter the small intestine and then directly into the blood stream. This provides the fastest uptake of amino acids to skeletal muscle cells who are craving these nitrogen containing compounds so desperately after training. In addition to a fantastic source of protein and aminos, recover EX uses maltodextrin and glucose at a ratio of near 2:1 per gram of protein. This has been proven to be the most efficient ratio of carbohydrates and protein post training. These carbohydrates refuel glycogen stores and help transport small compounds e.g. creatine, around the body more quickly. The rapid replenishment of glycogen prevents catabolism by blunting the bodies main catabolic hormone cortisol. Certainly a refreshing change in post workout drinks thanks to the 3 delicious flavours that do not sit heavily on your stomach. The quality of the ingredients and flavours are unrivalled. Put 500ml of cool water into a shaker bottle and add 2 heaped scoops (80g) of powder and shake until thoroughly mixed. Leave to settle for up to a minute and then drink immediately. Take one serving immediately after a training session. Do not take with other foods as this will impair its effectiveness. You can eat/drink a meal after about 60 minutes. If you train multiple times in a day, you can use Recover EX after each training session. Use no more than 3 times in one day. Do not use Recover EX other than after training. Can t recommend this product highly enough. Having used AfterGlow in the past didn t think I would find anything to come close. Purchased 5kg Org/Fruit. Mix with 500ml tastes good, mixes perfect. x4 weight session sx2 cardio per week on a low carb diet and this stuff helps with recovery so much. Also find I m sleeping better since. Had for 5 weeks only thorugh about half the tub and thats taking 4-6 shakes per week post-workout. Bargain, high-quality, superb all round. I am not a rep but BUY THIS! !